Do You Ask Yourself: Am I An Alcoholic? Millions of people in the UK drink alcohol on a regular basis. They enjoy going to parties or the pub with friends. Many also drink at home, having a glass of wine with dinner or a beer when watching TV. They would say they have a healthy relationship with alcohol and it is just a part of life. When does casual drinking turn into a problem? How do you know when you have crossed the line from being a person who enjoys a drink on occasion to becoming an alcoholic? You may convince yourself you are not the type, with a good job and a happy home life. You like a drink now and then, but, you don’t have an issue. People often have an image in their mind of what an alcoholic looks like. They still see the homeless and destitute or the unemployed person, drowning their sorrows. However, alcoholism is an illness affecting all walks of life, from the man on the street to the executive. 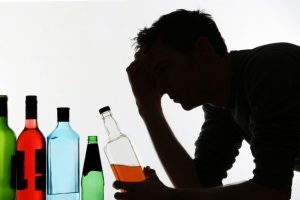 Many have claimed to have their drinking under control and can stop whenever they wanted, but alcohol addiction can take over a person’s life, sometimes without them even realising it and anyone can fall under its grip. So, how do you know if you have a problem and could be drinking too much? There are two kinds of excessive alcohol abuse, heavy drinking and binge drinking. For a man under 65, the first means having four drinks a day or more than 14 a week. For a woman, no-risk drinking constitutes no more than three drinks a day and 7 in a week. Binge drinking is considered consuming a great deal of alcohol on a single occasion. For a man, it means having five or more drinks in two hours. For a woman, it is four or more drinks. If you keep within moderate alcohol use or social drinking if you consume no greater than fourteen units of alcohol in a week. If you are concerned you may be drinking to an alcoholic level; then you should look for the signs. Do you crave alcohol and make it a priority over everything else in life, such as work and family? Do you neglect your responsibilities such as buying groceries and paying bills to get the money for alcohol? Do you start drinking as soon as you get up in the morning and continue during the day, despite knowing what it may be doing to your health? Those in the throes of addiction find it hard to stop drinking when they start and cannot control how much they take. They may consume alcohol by themselves in secret and then feel guilty about it. Alcoholics can also experience irritability and mood swings and suffer the symptoms of alcohol withdrawal when they stop drinking. These are just a few of the indicators that you or someone close to you may have a problem with addiction. If you are afraid you might be drinking beyond the level of casual consumption and may be an alcoholic, you should consider treatment. Speak to a counsellor or choose alcohol rehab detox at a clinic. It can get you the help you need to get your drinking under control.